If you want to participate in this tournament, you have to accept the rules below. 1.1 - During the season every team will play 1 match per week, each match comprising 2 maps. Default match day and time is Saturday or Sunday from 19:00 to 22:00 GMT+2. 1.1.1 - Teams are allowed to change the date and/or time if both parties agree. Teams who want to change any given date should propose another play date as soon as possible. If there is less than 24 hours left until the arranged match time, the match cannot be rescheduled anymore. Both teams reserve the right to refuse any date/time change. 1.1.2 - The last possible match date is the last scheduled round (last default date on your schedule of the on-going season). If teams aren't able to play some of their matches, the respective scores will be nullified (a draw with no points) or a W.O. (walkover) will be awarded to the active party. See also NO SHOW below. 1.1.3 - All matches must be played on the FWL Official 1.33/1.4 || LRv2 servers or - if both teams agree - on any other server that has LR activated. 1.1.4 - The default patch of the tournament is LRv2 with 1.33 settings. However, teams may play on LR with 1.4 pure settings if their opponents agree. This means, if one team would like to play with 1.4 settings instead of 1.33, the other team has to approve explicitly. 1.1.5 - All matches must be played in ASSAULT or TDM mode (depending on the kind of league you are playing in). 1.2 - During every match an admin may be present as a spectator. 1 neutral extra spectator can be chosen per side, i.e. if your clan plays another team, you may bring aboard someone neutral from another team participating in the tournament. This limitation is only in place to prevent server lags; if both teams agree, more spectators may join. 1.2.1 - Spectators other than admins/referees are strictly forbidden from communicating with players in whatever way possible (e.g. teamspeak) while the match is underway. 1.2.2 - Both teams can refuse to have a particular spectator present (other than admins/referees). 1.3 - If something unexpected happens to the game server, e.g. a crash or lags evidently affecting several players, the match will be repeated on another date and the score of the unfinished match shall be discarded. It is also possible to switch to another server and replay the affected match from the beginning. See also CONFLICTS / PROBLEMS below. 1.4.1 - Win = 3 points. Draw = 2 points. Loss = 1 point. 1.4.1.1 - If your team wins, if you are awarded a walkover or if the opposing team forfeits, you will get +3 points. 1.4.1.2 - If your team draws, you will get +2 points. 1.4.1.3 - If your team loses, if a walkover is awarded against you or if you forfeit, you will get +1 point. 1.4.1.4 - If 2 teams fail to play their match during the season, they will both get zero points for that match. 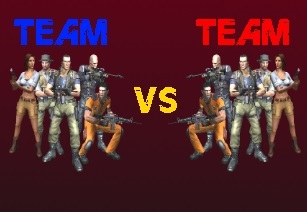 1.5.1 - 5 vs 5 is the maximum amount of players; a team cannot have more than 5 players participating in a match at the same time. 1.5.2 - If a team is missing a player before the match starts, it is possible to play with -1 player on that side as long as both teams agree. If both sides agree, it is also allowed to reschedule the match to another date/time. 1.5.3 - If a team has not arrived in time (30 minutes of tolerance) or their number of players is less than two, the other team wins this match and is awarded +3 points (walkover). 1.5.4 - If both teams are absent or their number of players is less than two, the match will be considered a draw, but no points will be added to each side's score. 1.5.5 - It is allowed to replace up to two players per map if they are having connection problems or otherwise cannot continue gaming. 1.5.6 - Players who have been in game earlier must leave the server before their respective substitutes are allowed to connect. It is not possible to have players from a team watching in spectator mode after the match has already started. See also section #4.2.5 for more information. 1.6 - Admin decisions cannot be contested unless they break the rules! 2.1 - The rounds are played according to the round-robin tournament system. Each participating team plays every other team an equal number of times on an equal number of maps. 2.2 - The servers must be set up as explained in section #5 below. 2.3 - Rounds begin when both teams announce to be ready. Teams can stop the live round twice if they detect that the server settings are not in accordance with the rules. 2.4 - No pauses are allowed during live rounds. After finishing the first map, teams may take a short break (e.g. 10 minutes) before the second map starts. 2.5 - The maximum duration for the 2 maps played in every match will be as follows: For the 1st + 2nd map: (40min + 40min) = 80min plus a 10min break, totalling 1.5 hours. 2.7 - The clan leader/team captain of the winning team is required to submit the score via match comments. The losing team has to accept the score by posting an approval. If no approval is recorded within the first 6 hours of the match report going online, approval is considered granted. Admins will update the score and include it in the league ranking as quickly as possible. 2.8 - Screenshots are not required for confirming match results if the opposing team approves of the results. We encourage all clans to take screenshots of each map's end screen anyway, so the results cannot be contested! 2.9 - Both maps must be played on the same date that was previously agreed upon by both teams. It is not allowed to play one of the maps on another date unless a server crashes twice or more often during a match and both teams agree to postpone the match/rest of the match to another date. See also CONFLICTS / PROBLEMS below. 3.1 - All accepted maps as picked by the individual teams will be published on the News main page by the website admin before the season starts. 3.2 - All teams must select a different map to play. It is not possible to select the same map that another team has already chosen for a given season. 3.3 - All selected maps must have the same number of flags for all teams (e.g. "3"). 4.1 - No cheaters are allowed on LR servers. In case someone is caught cheating, then he/she will be banned from this website and will not be allowed to play anymore. The clan for whom the cheater has played will lose all points gained up to the exclusion of this player. If the cheater continues to participate in the tournament, his/her whole team will be disqualified. 4.2.1 - ...you don't play with your real nickname and your team/clan tag. 4.2.2 - ...you use foul language, curse, insult or call other players bad names or cheaters. 4.2.3 - ...you surpass your +1 spectator limit during the match. This is only to prevent server lags; if both teams agree, more spectators may join. 4.2.4 - ...you repeatedly and purposely kill your opponents in their spawn. Some maps are more prone to this problem by design, so please show common sense and heed warnings by admins/referees. 4.2.5 - ...you watch as a spectator longer than 30 seconds more than twice after the game has already started, or if you play and leave the server repeatedly. 4.2.6 - ...you spam our forum site. * If your team loses more than 3 points due to the rules above, your clan will be disqualified and all your matches will be discarded as invalid. 5.1 - The tournament will take place every Saturday and/or Sunday from 19:00 to 22:00 GMT+2. 5.2 - All matches must be played on the FWL Official 1.33/1.4 || LRv2 servers or - if both teams agree - on any other server that has LR activated. 5.3 - All matches must be played on the pre-agreed maps from the accepted maps list (see section #3). 5.4 - Number of players should be 2v2, 3v3, 4v4 or 5v5 (= maximum). 5.5.00 - The server should be locked before the match to prevent non-involved players from joining or causing trouble. 5.5.00.1 - The server password should be kept a secret and should only be shared between the participating teams and the admins/spectators. 5.6 - This league uses a round-robin system: Teams play each other in an equal number of rounds and maps. 5.7 - All matches will start between 19:00 and 22:00 GMT+2 Check the date/clock in the header of this website! 5.8 - All teams that want to participate in the tournament need to register on the Far Cry Wars League website within the given sign-up timeframe. A clan/team tag and a list of players must be provided. At least 3 players must be enlisted per team. 5.8.1.1 - Clan tag: "MFA"
5.9 - Every team must have at last 1 official clan leader or captain on their squad to record all match dates and final results, to post screenshots (check section #10 AFTER THE MATCH) and to report any issues to the admins (see also CONFLICTS / PROBLEMS). 5.10 - VERY IMPORTANT: Everybody should be on the server at least 10 minutes before the match. 5.11 - VERY IMPORTANT: Don't forget to request server admins to remove the server password after finishing all maps for the day! Otherwise other players won't be able to connect to this server afterwards. 6.1 - Before a new season starts there is a sign-up timeframe for clans to decide whether they want to participate or not. Every upcoming tournament will be announced on the frontpage well in advance. If a clan decides to participate, the team leader needs to enroll his clan from the main menu SIGN UP link. After signing up and if all requirements are fulfilled, you should see your team in the sign up section of the main menu. 6.2 - Please add the skill level and division of your team in the "Additional info" section, so admins can place teams in the appropriate divisions. We will try to create divisions as equal as possible. 7.1 - Each team must have at least 3 active players to be accepted for the upcoming season. Players need to be added to the team roster before the first match of the season. All players must be registered at this website and have their Battlelog username entered in their profile. Players must also be added as active players to the current league in the "Team Management" section (example picture below). It is up to the team leader to ensure that the right Battlelog ID is filled in when a player is activated. The guideline is that clan leaders/team captains should select their seasonal squad before the season goes live! 7.2 - During the season clans are allowed to change their roster or add more players to it. Individual players can belong to only one active team for any on-going season, though. Players are allowed to switch their teams but may belong to only one squad at a time. 7.3 - Player transfers are allowed during the whole duration of the tournament; there is no maximum limit of how often you can switch teams. However, admins will advert to constant team switching. This means that players are not allowed to jump from one team to another without good reason! Each team needs to have at least 2 players online on the match server 30 minutes after the start time of the match (default: Saturday/Sunday between 19:00 and 22:00 GMT+2). Otherwise, the opposing team will be awarded a W.O. victory. W.O. victory = walkover. It's the awarding of a victory to a contestant because there are no other contestants or because the other contestants have been disqualified, refuse to play without reason/justification or because they forfeit. W.O. victory = 3 flags/map. If you score a full forfeit victory over an opponent, your team will therefore gain +3 points per map (2 maps = 6 points in total per match). If teams are not able or unwilling to contact each other beforehand, then the default date and time will be considered as their official match date and time. Always try to contact your opponent or at least post something in the match comment section of this page to avoid no-show issues! See also #9.1. 9.1.1 - Make sure to contact your opponent before the match. For instance, use the Far Cry Wars League site to post match comments or use this site's personal messaging service or shoutbox. Exchange server infos and let the other team know if you would like to change something (match date and/or time) or ask them if they allow freelancers. Every match needs to be confirmed by both teams to avoid no-show issues. Confirm if you have or don't have your line-up ready at least 24 hours before the actual match time. 9.1.2 - If a team doesn't confirm their match 24 hours before the scheduled time (i.e. post their confirmation in the war comments), the opposing team is allowed to take a W.O. victory. In order to do so, they need to provide a screenshot with date and time included, proving they had their full line-up ready on the match server at the default match time. 9.2 - It is recommended that each team has at least one player present on the Far Cry Wars League TS3 to report any issues. 10.1 - SCORING SYSTEM: The Far Cry Wars League tournament consists of 2 maps which are played from both sides (red and blue) by both teams. See also section #1.4. * Screenshots are not required for confirming match results if the opposing team approves of the results. We encourage all clans to take screenshots of each map's end screen anyway, so the results cannot be contested! 11.1 - Before the start of each match, both team captains should check if the opposing side has enlisted players who are not registered and active in the league (so-called freelancers). 11.2 - Freelancers cannot be brought into a match without having an approval from the other team first. Freelancers have to be on the match server before the first live round, or their team at least needs to introduce potential freelancers they might have to use before the match starts. Also, if a team is going to replace quitting players with freelancers, the freelancers have to be accepted by the other team before the match or in-game. If a game starts without checking the players or if an agreement is made in-game between the 2 teams that the use of freelancers is acceptable, no protest may be filed afterwards. * VERY IMPORTANT: Players and freelancers are not allowed to play for a team if they are already registered with another active team/clan in this league. This is called moonlighting and is explicitly forbidden in the Far Cry Wars League! * Before proceeding with any kick, all admins must inform the offending player at least twice that he/she will be kicked. In case he/she keeps doing the same thing and ignores the admin, the admin is allowed to do a temporary ban as a punishment and report to the FWL head admin via e-mail or private message. RESPECT ALL ADMINS, THEN FWL ADMINS WILL RESPECT YOU AS WELL! * Include all the information needed and all the evidence you have, like screenshots, video recordings, etc. * Describe the problem properly! What is the protest all about? Against whom or what do you object? * If it is a delicate matter, keep quiet and let admins do their job before flaming all over! ...fix certain settings such as game patch, respawn time, rocket launcher, friendly fire etc. Please follow the FWL season rules for each match! Server admins are not allowed to abuse their admin rights, e.g. ban or kick without strong reasons to justify these actions. If there are any complaints about server admin abuse, the situation will be assessed and investigated by FWL crew members. If the complaints are confirmed, the FWL team will remove the admin rights from this particular person forever! Remember this server game rule: RESPECT THE SERVER ADMINS, THEN THE SERVER ADMINS WILL RESPECT YOU! * Any use of cheats and glitches in the game is obviously strictly prohibited. * Any player who gets caught cheating will immediately be removed from all future games in the league. The clan with whom the cheater has played will automatically lose all points gained up to the exclusion of this player. If the cheater continues to play in the tournament, his/her whole team will be disqualified. * If a team breaks a rule in the game, penalties may be given depending on the severity of the offence, e.g. if someone is respawn killing or using bugs/glitches. Admins will handle every conflict individually. Minimum penalty will be -1 point in ASSAULT mode or -10 kills in TDM/FFA (see also #4.2). We encourage teams to use common sense, play fair and show good sportsmanship! Accidents do happen, before protesting let the other team know what they are doing wrong. If you cannot resolve the issue with your opponent, then contact admins. If the server which clans have selected to play their match on crashes during a live round, the teams have two options to choose from. It's up to the teams themselves to negotiate which option they should pick. If the teams do not agree to continue with OPTION 1, then OPTION 2 is automatically applicable. 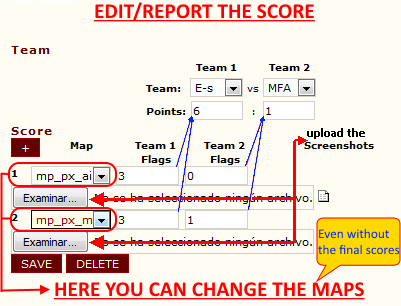 OPTION 1: Use the last number of flags/points recorded/remembered as the end result of the round. Talk and deal with your opponent! Both teams need to accept this solution, else proceed with OPTION 2. OPTION 2: Replay the whole round. Start a fresh round and ignore the scores of the crashed round. If a server crashes twice or more often during a match, teams are allowed to demand a server change or to postpone the match/rest of the match to another date.